De Blasio, who was joined by his wife, First Lady Chirlane McCray, in wishing the outgoing chancellor well, called Fariña’s departure “bittersweet”; he is expected to launch a national search for her replacement as he begins his second term. 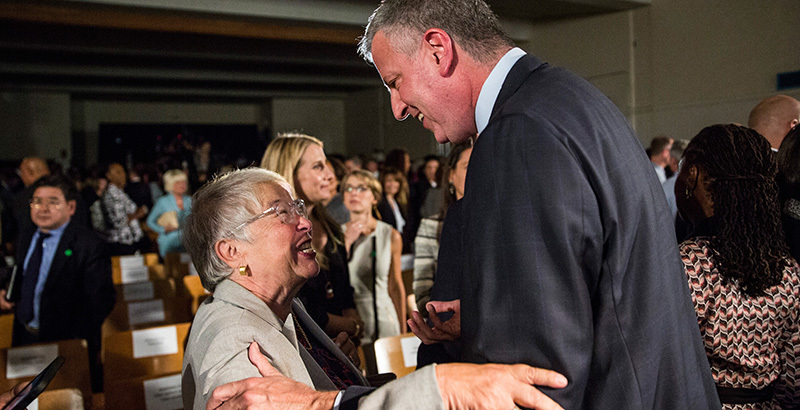 New York City Schools Chancellor Carmen Fariña is stepping down after four years of running the nation’s largest public school system, according to multiple news reports. The story first broke on Politico. Fariña had no comment about the reports following a Wednesday night meeting of the Panel for Educational Policy, Chalkbeat reported. Mayor Bill de Blasio also declined to comment. The 74 reported exclusively Wednesday night that the mayor is not considering Fariña’s list of internal candidates to serve as her successor. The Renewal program, which has cost taxpayers $582 million, provides failing schools with extra supports and social services to try to turn them around. Its creation marked a dramatic shift away from the policies of de Blasio’s predecessor, Michael Bloomberg, who shuttered failing schools and replaced them with new, better options rather than try to keep them afloat. As of press time, only an initial few reactions to Fariña’s resignation from prominent education advocates and advocacy groups had rolled in. During her tenure, Fariña saw test scores and graduation rates rise, re-engineered support networks for principals, and was credited with helping to improve conditions for teachers. But she was also criticized for moving too slowly to address segregation within the school system and for reviving the forced hiring of teachers from the city’s Absent Teacher Reserve pool. Now, speculation turns to who will replace Fariña as head of the 1.1 million–student school system. A nationwide search is already underway, according to Politico. —Mark Keierleber contributed reporting for this story. Disclosure: The 74 is partially funded by Bloomberg Philanthropies, and Howard Wolfson, head of Bloomberg Philanthropies’ education programs, serves on The 74’s Board of Directors. Co-founder & CEO Romy Drucker previously worked at the New York City Department of Education.